Handling of metal and plastic containers. 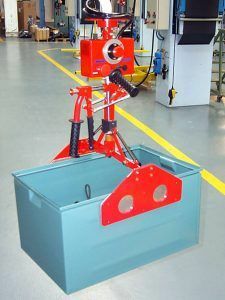 Dalmec Manipulators equipped with gripping devices for the handling of containers with different dimensions and characteristics. 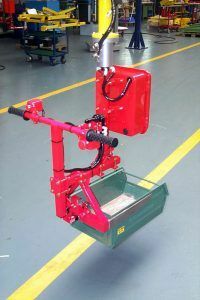 Hundreds of Dalmec manipulators are used for handling loads in the leading industries all over the world. 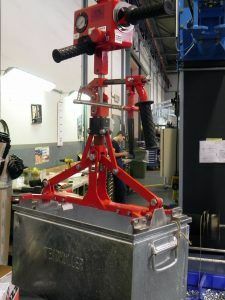 Our manipulators are equipped with different types of gripping devices able to lift, rotate and tilt reels of all sizes and materials with a weight from 5 Kg to 900 Kg. 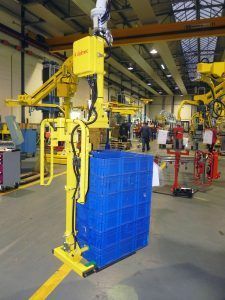 Pneumatic Manipulator Posifil fitted with tooling for gripping and handling containers and boxes. 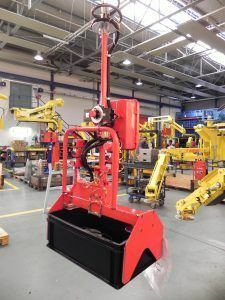 The manipulator is a Posifil, a double rope manipulator with a large radius of action, up to 5000 mm with weight capacities of 80 kg. 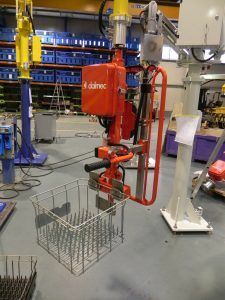 Dalmec Manipulators for containers are custom-built, with specially adapted design, dimensions and picking systems to suit the specific requirements of the users and the various environmental conditions available.